In an inadvertently amusing press release this week, the Harvard-Smithsonian Center for Astrophysics released a study calling for a four-armed model for the Milky Way, but used an illustration created by Robert Hurt six months ago to support a Spitzer study concluding that our galaxy has two spiral arms! Just goes to show that decent illustrations of the Milky Way (and good scientific illustrators) are still in very short supply. But is it that surprising that the two studies draw different conclusions? No. Like the proverbial blind men describing an elephant, the two groups of scientists are examining very different parts of the Milky Way. The Spitzer study detected hot objects visible in infrared. The CfA study used radio telescopes which can also detect colder objects such as supernova remnants, very young star formation regions and huge clouds of hydrogen gas. So it seems as though the older established star formation regions are mostly concentrated in two spiral arms, but that the very new star formation regions and the hydrogen clouds from which they form are also developing in two additional arms. If you were hovering above the Milky Way in a spacecraft using binoculars or a regular optical telescope, you would see two main arms. But if you also had a radio telescope with you, it would detect two more. This pattern of different spiral structures at different frequencies is actually quite common in other galaxies as well. For example, see this story about M106. 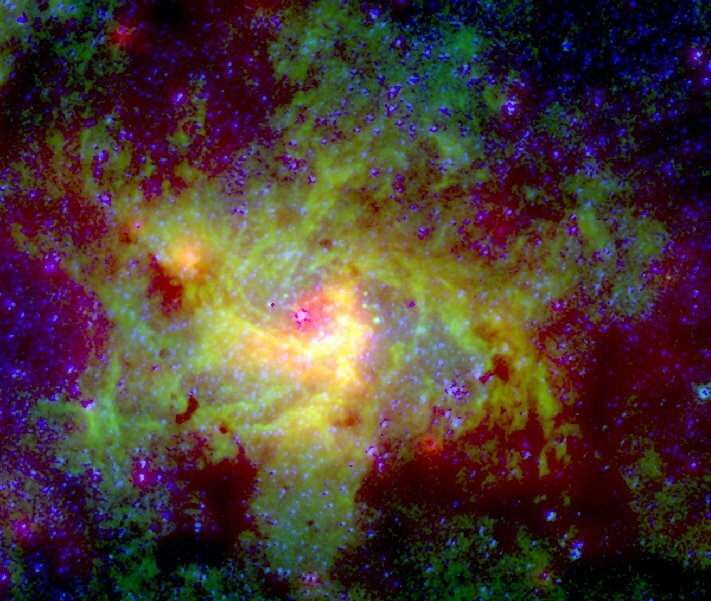 This is the most detailed image I've ever seen of the galactic nucleus. This brings out great detail in the central spiral swirling around the ball of hot gas surrounding Sgr A*, the 4 million solar mass black hole at the core of the Milky Way. A couple of weeks ago, I discovered that I could no longer log-in to post updates to this site. I decided that that this was a sign from the computer gods (or perhaps my Internet service provider) that it was time to upgrade my Drupal installation. So now this site is running the latest version of Drupal (6.8 as I write this). I didn't migrate the user accounts, however, so if you want to post comments, you will need to register again for a user account. Apologies for the inconvenience. I've added the SuperCOSMOS explorer to the Introduction to the Milky Way Explorer. This shows detailed hydrogen-alpha images of the southern galactic plane (30° > l > 210°). As I explain in the Introduction to the Milky Way Explorer, the SuperCOSMOS data is not calibrated and there are some obvious plate transitions. Nevertheless, I think that these images are very useful and show details of some large faint nebulae that I've never seen before. For example, here is an image of Sh 2-11 (the War and Peace nebula) together with the much less known Sh 2-12 and Sh 2-13, which I've never seen properly imaged anywhere before. 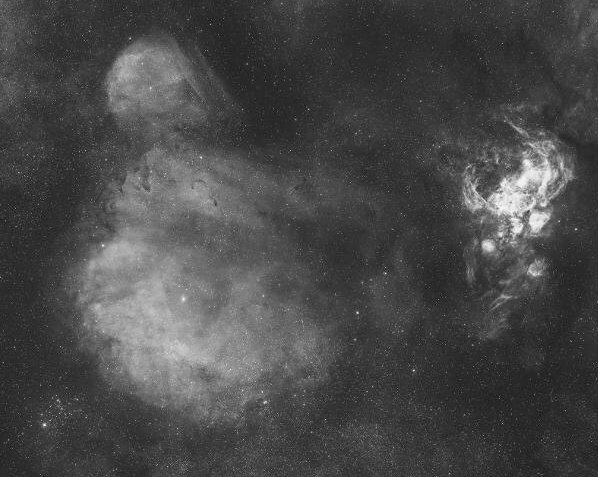 Sh 2-12 is the larger nebula on the left, and Sh 2-13 appears above it. All three nebulae appear to be ionised by stars in or near the Sco OB4 association. The Avedisova catalog is a fantastic resource but can be a bit intimidating. I've added a "Prominent object names" line to each Avedisova summary page and an Avedisova glossary to make it a bit easier to figure out what these objects are (or at least how they were first detected).